In August 1974 eight Motorola employees including Bill Mensch and Chuck Peddle quit and went to work for a small chip manufacturer named MOS Technologies. By June of 1975 they had developed samples of the now legendary 6502 processor and needed a system to demonstrate it’s power. The problem was that until they could produce a demonstration unit to show industry what the 6502 could do, they were limited to selling very small quantities of the chip directly hobbyists. They charged just for just US$25 (adjusting for inflation that is $110 in 2018) at a time when its functionally reduced competitor, the Motorola 6800 was selling for $200 (which is $900 2018 dollars). In 1976 MOS designed and manufactured that needed demonstration computer. It made history with the worlds first single board computer: the KIM-1. Of course it used the 6502 (clocked at 1 Mhz) and it came with 1K RAM, built in ROM, hex keypad, 7 character LED display, 15 bidirectional input/output ports and a cassette interface (for storage!). All of these components came fully assembled on a the KIM-1’s 9″ x 10″ board although it did not ship with a power supply. They sold for $245 ($1100 2018 dollars). KIM is an acronym that stands for Keyboard Input and Monitor. Monitor in this case does not refer to a screen display like we have today. Monitor refers to the VERY basic software that allows a user to see what is in memory. 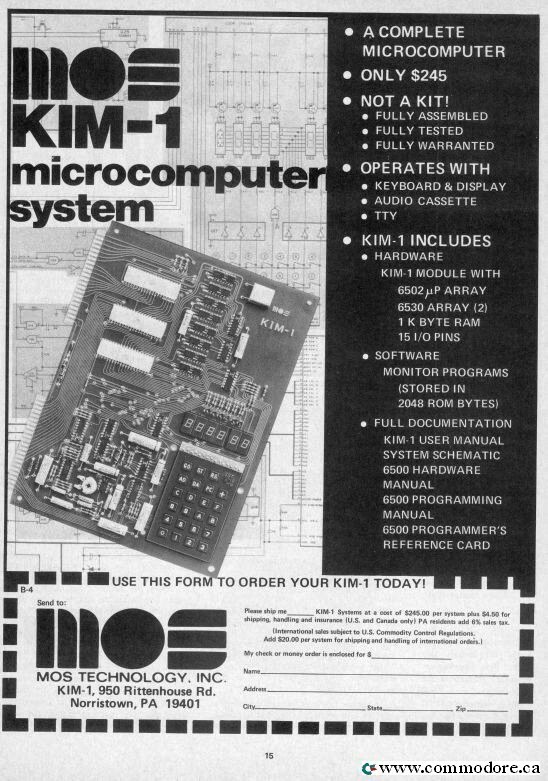 Commodore bought MOS in the summer of 1976 and slightly re-branded the MOS KIM-1 to a COMMODORE KIM-1. Over a short period of time, it became apparent to enthusiasts and corporations that the KIM was more capable than originally intended. Instead of being used just a basic training device, companies were using it to control mechanical machines like factory equipment and Universities were using it for ‘real education’. Note that it takes about 1K of RAM memory to fill a single 25 line x 40 character screen with text so MOS KIM-1 was indeed a very limited computer. MOS / Commodore did not produce a second version of the KIM-1. The KIM board was redesigned and enhanced to become the worlds first personal computer, the Commodore PET, which included good looking metal chassis, calculator keyboard, integrated cassette storage, and internal power supply. An important side note is that in 1978 Rockwell International introduced a slightly expanded version of the Commodore KIM-1 as the AIM65 for USD$375 ($1350 dollars in 2018). If you are familiar with the AIM65, you may think the name came from the computer including Advanced Interactive Monitor (AIM) with a Commodore 6502 CPU. The AIM was a very simple piece of software allowing the user to assemble binary, view and set memory. However, AIM is an acronym that stands for Advanced Interactive Microcomputer. The AIM-65/40 was released in 1981 with a 40 character LED display for home and small business enthusiasts. An industrial version was named the System 65 included such advanced features as a plastic housing, floppy drives and a PROM burner. In parts of Europe AIM65’s were assembled and distributed by Spains Comelta. They produced the Comalta Drac-1 and further enhanced the AIM65 to include their own plastic chassis and two eight inch floppy disk drives. All versions were compatible with the original MOS/Commodore KIM-1. The MOS Commodore KIM-1 was the worlds first computer assembled into just one board and was also the only computer Commodore allowed to be manufactured by other companies. Commodore KIM1 – Rev F BLUE Commodore KIM1 – Revision F but on Blue Board. This is a much rarer and much more valuable board for collectors. White Commdore MOS KIM-1 This White Board KIM-1 board is even more rare than the blue boards and is very highly collectable.